5 Reasons to visit Broome in July! Blue- and red-coloured landscapes are generally associated with other planets, abstract art or young children! But while you’re checking out all the amazing things to do in Broome you can experience a distinctive red and blue landscape for REAL! The ocean’s characteristic blue hue from white clay in the water combines with the red local Pindan rock and soil in a gob-smacking hit of colour. For milder temperatures and clear, sunny days the best time to visit Broome is in July. But while the colour is a big part of the Broome experience, it’s not the only reason to visit. 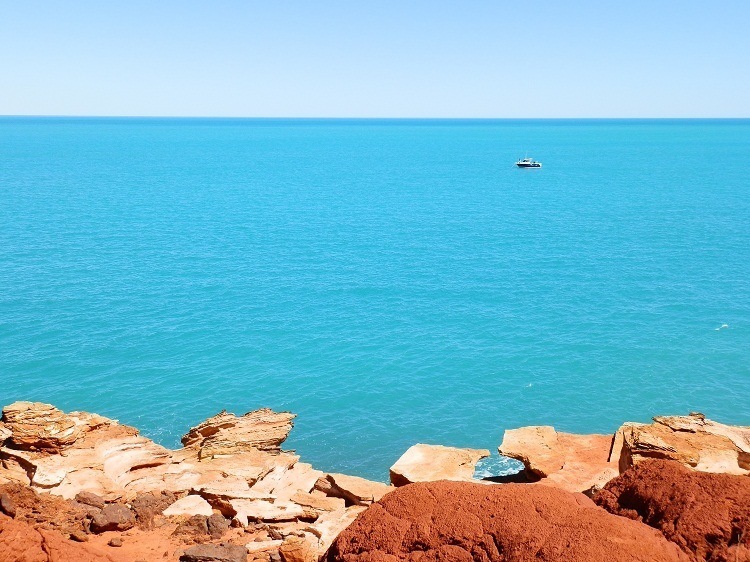 Because whether or not you’ve got a thing for red and blue, exploring these 5 fabulous attractions will make your holiday in Broome an unforgettable experience. The chances of finding a spot for yourself on Broome’s world famous Cable Beach are better than average. This stunning curve of sand so white it hurts your eyes stretches for 22 km (13.7 miles) so despite the Australian winter tourist season’s increased number of travellers at the cafe above, there’s more than enough room on the sand below. If other tourists on the beach is too much for you, go for absolute solitude just a few kilometres north, through the laid-back community of Coconut Wells and over the dunes to the beach. There’s a Dune Buggy track or two. And a couple of people WAAAAAY further down the beach. And a few shags* on a rock. But you’ve got several kilometres to yourself. OK? It’s a long hike through the mud to the Catalina float-plane wrecks that only emerge from Broome’s Roebuck Bay at very low tide. So I didn’t do it. I had just as much fun at the world famous Broome Bird Observatory on the shores of Roebuck Bay a few kilometres up the coast. In the rapidly rising 9 metre tide, close to being highest in Australia, we spotted what looked like a car roof down amongst the mangroves. It WAS a car roof. Actually, two! Yes, it’s possible whoever drove an uninsured 4WD along the sands of the bay at low tide couldn’t have anticipated being bogged up to the axles. But the person who tried to pull him out??? If you aren’t lucky enough to watch a double-car-extraction from soft sands between high tides, don’t despair. There are a lot more things to do in and around the Bird Observatory, where thousands of migratory wading birds flock along the bay’s RAMSAR-listed shores along with the twitchers** trying to spot them. A Yellow Chat birding tour to see one of Australia’s rarest birds; a dawn ramble to the ocean through a dense tropical mist; scenery so superb even the most amateur*** photographer’s shots look good; Snub-fin dolphin sightings from the observation platform; and an array of shorebirds so dense it takes a telescope to sort them out! Just walk the dramatic curve of Roebuck Bay below the observatory for full-on relaxation in a spectacular setting. Back in Broome watching the world renowned ‘Stairway to the Moon’, where the moon rises over the Bay is a must see! Initially skeptical – it’s just the moon rising over the sea like anywhere else in the world where the moon rises over the sea, right? – the real thing stopped my cynicism dead! And if there’s no car in the bay for entertainment, maybe the Catalinas are worth a visit instead! They’re probably just as interesting. No, REALLY! There’s no best time of day to experience all the things to do at Gantheaume Point – any time is good! At high tide, watching swimmers leaping from the red Pindan rock into a sea so blue it looks like it sucked all the colour from the sky is just like a scene from a movie set. And at low tide – approximately 9 metres lower – the rock platforms emerge from the sea, exposing strange rock gardens full of exotic corals and dinosaur footprints. The brightness of day where the sea sparkles against the rocky Bingle Bingles around the Point from the unusual Lighthouse contrasts with the incredible twilight and sunset as the orange sun plunges into the Indian ocean and the rocks turn to fire. There’s always something happening at Gantheaume Point. So visit any time. BUT … be warned! The High tide/low tide/daylight/twilight scenes are SO different you’ll want to experience all of them. HHHMMMmmm… perhaps it’d be easier just to spend the whole day there?! If like me, you’re a sucker for world exclusives, take in a movie at Sun Pictures, world’s oldest operating picture gardens – where the entertainment isn’t all up on the big screen! After admiring the movie memorabilia lining the walls since its official opening as Sun Pictures in 1916, cinema-goers take their seats and don their jackets. The coolness of a Broome evening shouldn’t come as too much of a surprise – because despite the ~29°C July daily maximum temperature, it really IS winter! But after the sun sets and darkness falls over the open-roofed theatre and the show starts, there’s another surprise in store. WARNING: To avoid spoilers, SKIP THE NEXT PARAGRAPH! Watching the generally unremarkable cinema advertising is interrupted without warning as a low flying passenger jet only a few metres above the screen screams into Broome airport. Accompanied by the odd shriek – or two – from patrons unaware of the special acoustic qualities of this unique combination of landing jet and open-roofed building! Photos? C’mon! Do you REALLY think my shutter-button finger was THAT quick? Luckily, one of Australia’s most unusual public amenities blocks with an ever-changing backdrop is right below the big screen! AND … it’s in MY BOOK!!! Even if you’re totally unaware of Broome’s history there’s a few dead giveaway clues to its heritage. Like the pearl showrooms and sales outlets in the main shopping precincts. The well preserved pearling lugger in Chinatown’s main street. The Japanese and Chinese cemeteries where hundreds of pearl divers are now at rest and commemorative statues and plaques in the main street. The inclusion of pearl meat at some of the eateries And the staggering array of pearl-related products at the weekly markets! Yes, it’s impossible to ignore the rich pearling heritage of this beautiful city, the jewel of the Kimberley coast. So when we were thwarted by an anti-mining blockade from our drive north up the coast to controversial hot-spot and whale nursery James Price Point, Plan B kicked in and we arrived at Willie Creek Pearl farm ready for action. As a aerophobic, my scenic helicopter flight over the magnificent estuary system glowing with colour and light could have ended badly. Luckily I was distracted by the staggeringly picturesque landscape unfolding beneath. So my amateur*** photographic instincts completely overcame any lingering thoughts about crashing to the ground and dying a horrible death. Relieved I was still alive after the successful touchdown, I just had to buy myself a little reward souvenir! Who knew (or cared!) that the $9 black seed-pearl ring I selected was from the children’s section? While it might not be to everyone’s taste, the showroom had plenty of REAL jewelry and pearl-related artefacts for pearl purists!! … but decided to wait until next time! I see a repeat performance of ALL these awesome things to do in Broome in July somewhere in my future. But don’t leave all the good times up north downunder to me! Start right here, right now! Compare the cheapest flights online … and I’ll see you somewhere up there on a sunny July Aussie winter’s day!! 7 Days in … Quilpie! I’ve wanted to visit here for a long time. Next time I’m back in Auz, I HAVE to go! High quality information. Thank you so much for providing such photographs. I will for sure refer my friends the same. Thanks for Photographs and pictures of sun. @Freya – I can’t take the credit for the photos – it’s almost impossible to take a bad picture in the midst of such scenery! @Une Angevine – Le rouge est si intense qu’il fait mal aux yeux! @ladyfi – I’d love to see what YOU could do with such a landscape! It’s an amazing photographic experience! @Jana – I could do with a bit of cold down here – it’s been VERY hot!! I hope you can see Broome for yourself one day! @PDP – All I can do is present the facts and hope others will do themselves a favour! I can confirm all of the above Red and if this post doesn’t tempt at least one or two people to visit I’d be mega surprised! great impressions, its one my list for next visit to Australia, I really liked western Australia, happy weekend+cold greetings from tulipland Holland! 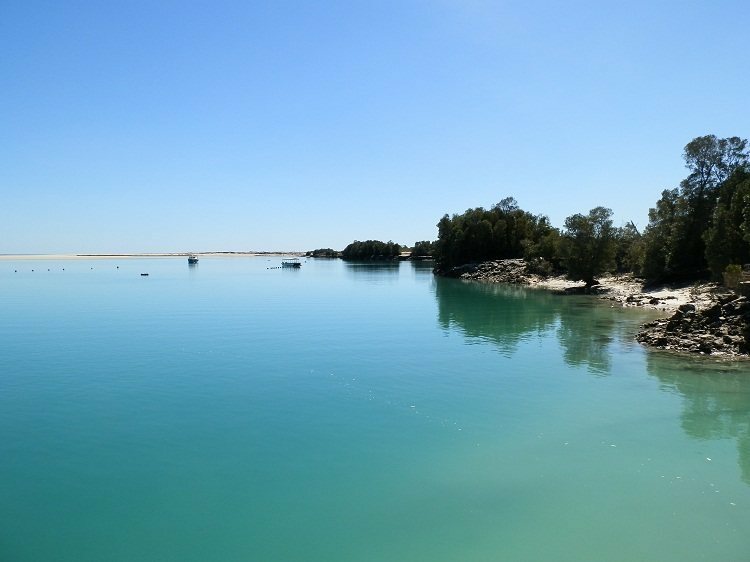 Wow – Broome is so gorgeous and your photos are stunning. WoW what a stunning place, I love rock formations but in combination with these beautiful beaches it is even more awesome. Beautiful photos ! @Mary – Why, thank you!! Maybe I’ll let you submit the photo to a magazine for me … and apart from being stuck at the tail end of a long, hot summer, all is well down here! @Aleah – With such a big coastline, the odds are better than average of finding a stretch of beach to call your own! You’ve just got to get out & about – and I know YOU know how to do that! @SFlaGuy – C’mon! There were THREE people on the rock and at least a dozen on Cable Beach!! And how do you know I’m not photo-shopping them out??!! @J Gray – Then my work is done!! @Joan Elizabeth – Something tells me you’ll find it a little bit different to the Blue Mountains … but I’ll see you there, because it’s on my return bucket list as well!! @CA – Well, who’s stopping you?!?!?! You can only have so much Europe & New Zealand, right?!?! @Jane & Lance – The colours are unreal. I’ve been accused of ‘doctoring’ my photos – but I don’t need to!! Besides, I haven’t got the technical skills for that … and I DO count my blessings every day! @Bajazid T – So glad you liked the photos – Broome is full of these colours and awaits your visit!! @Iris – Haha, I didn’t realise vehicles stuck in the mud/water/sand was so common!! I’m sorry for making you ‘homesick’, but I’ve given you a goal now, right?!?! @tdbl – What were you thinking?? Actually, I can’t talk! I’ve lived in OZ most of my life and 2012 was my first visit to Broome! But I CAN assure you, it won’t be the last! @Jim – Thank you! Have a great weekend! @Filip – I’ve never seen anything like the colours of Broome! The beaches sure are different to what you’ve shown us of the Caribbean!! @Rohrerbot – You’re right, of course!! You’d LOVE the birding in Broome – it’s what we call in twitcher-land a ‘sure thing’. And unlike me, you’d be able to get bird photos that actually LOOK like the birds!!! @Fun60 – Yes, you’ll have to do all the bits you missed the first time!! Start keeping a list!! @Andrew – I didn’t try the pearl meat – it’s apparently a great delicacy! And the Horizontal Waterfall at Talbot Bay is apparently awesome – but I’ll have to see it next trip! 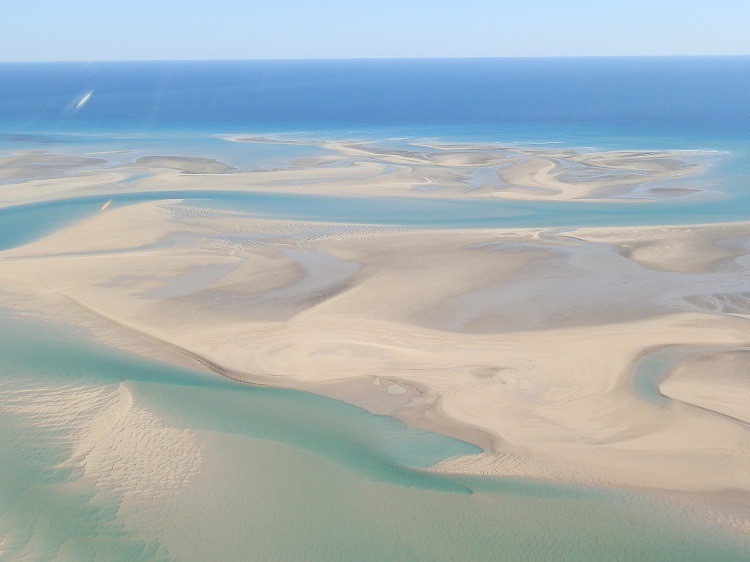 The highest accessible tide in the Southern Hemisphere is a couple of hours north of Broome at Derby. @George – It’s a photographer’s fantasy! See you there one day???!!! @Manzanita – Hahaha, love the ‘accent’!!! Sadly, my bird photos don’t really show it like it is … you’ll just have to take my word it’s an awesome spectacle! @Kate – Sensory overload is exactly right! I bet even non-photographic-obsessives (yes, there ARE such folks!) take lots of pix – the light, the colours, the subject matter … it’s all good! @BlossomFlowerGirl – Thank you!! It was a pleasure to be there & bring back such memories! @MJWC – Red tide is an odd thing to see – but you’re right, of course! It IS beautiful! @jennyfreedman – Haha, yes I read your blog post about the Catalinas!! The trick is to leave a place having something to look forward to for next time!!! 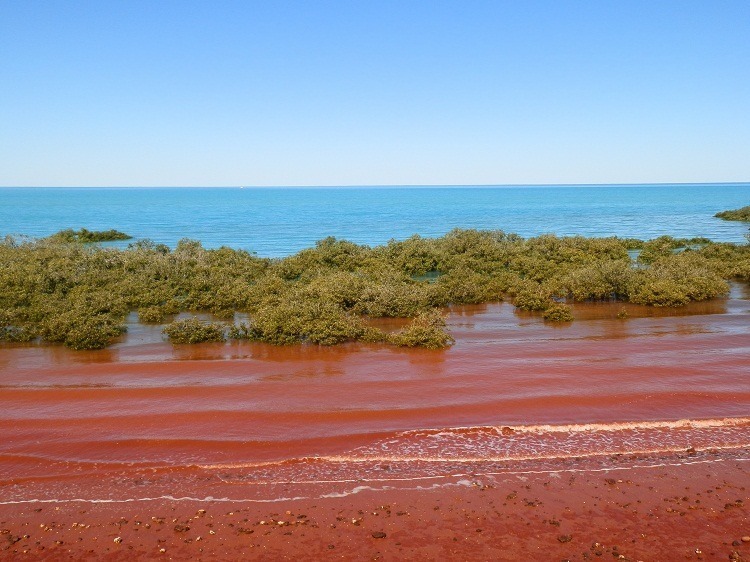 @Sallie – In Broome, the red tide is just the water lapping against the red Pindan soil, sand and rock – the colour leaches into the water. So it’s actually a GOOD thing! Fantastic. Definitely makes me want to visit this place. And the colors are truly grand. Wow. It’s on my bucket list. Stunning Images! – creates a yearning to see more of this beautiful country! Does absolutely no one live in your country? I could not swing a cat by the tail around here without it scratching someones eyes out. I am always amazed by so much unspoiled beauty. It always amazes me to see kilometers of sand, with no people or anything in them! Would definitely love to see it someday, + the helicopter ride too. Such a lot of fun! I love love that beach image with the stretch of white sand and the patterns of the tide marks. I have a photo very similar in fact. And the red dirt – just love red dirt. Wonderful photo essay about Broome Red. Have a great week. What a beautiful place! Your photos are just wonderful! Thank you so much for this great tour! Gorgeous. I am still kicking myself…7 years living in Australia and I didn’t make it out to Broome! It is high on my Australian bucket list! Those photos are gorgeous. Love the sunset shot. I really have to get back over there! You just made me very, very “homesick”! We´ve spent weeks and weeks in Broome in `95 and `99, sooo many good memories! These colors, awwww… thanks for bringing it all back! We took way too less pics, having “normal” cameras with real film with us. Stupid us, should´ve invested more! I got such good memories I had to ask Spouse about the airplanes over sun pictures! We went so-so often and he can remember only one plane. Did you have a Pizza in Sun Pictures? I sadly not, found out it´s allowed on our last day. You’ve convinced me that I really need to get to Broome. Although all your photos are marvelous, I really like your picture of the red tide. These colors I like the most: red, green and blue. This post consit all of them. Thank you, photos are great! So many amazing pictures Red. I really,really want to visit. I’m going to have to start saving for another trip to Aus. I think there are more than 5 reasons to visit Australia! I really really want to visit this place more down the road. I think it would require a lifetime to explore….I want to bird there so badly:) As for the beaches…..wonderful!!! What an absolutely fantastic landscape which, in places, looks almost surreal. And such beaches are unbelievable – all those miles of fine white sand with not a soul in sight. You are so very fortunate to live in a country with such a richly varied environment. Feast for the eyes! Sigh, how marvelous it must be to be immersed in such beauty all the time! Sigh again. The “amateur” (yeah, right) pictures are stunning. Fabulous place — I’d want to go every year. Questions: Red tide over here has a bad meaning (and I don’t think it looks that red)…it means that there is harmful algae in the water (I think)…it must not be bad at Broome..couldn’t be dangerous and yet so beautiful could it? And pearl meat? (do you mean oysters?)…. I knew about the word twitchers (which always makes me smile) and shag seems like a good word for cormorants, not one of my fav birds. If Broome wasn’t the place we head to for our winter getaway, your photos would definitely entice me to go there, Red! Fabulous. Aren’t we lucky that all of this is in our backyard. Next time you visit, I can recommend the walk out to the plane wrecks but leave early…the tide comes in very quickly as I found out! Pearl meat? Not sure about that. I would like to see Broome, mainly for the tides. Is it a bit further north where there are 15 metre tides? The scenery is glorious; almost sensory overload! Must be a totally delightful place to live in. Warning, skip… always makes everyone read it. Or that has been my experience ;o. What a special combination, red and white beaches. Great pictures. The red tide in Broome is beautiful. I have never seen red tide… except of course on your blog. Beautiful pictures as always. Beautiful photography of beautiful sights. Really a pleasure to look at. Verrrrry Interesting. I’ll just take the poils but I ain’t that kind of a goil. Another masterpiece of photos from your beautiful land down under. I would love to see all the birds.